Rollators are a mobility device, much like a walking frame, but they have the addition of wheels so the device can be easily moved without lifting it. They are often used to provide the user with support when walking independently. In some cases, users will need the extra support or balance due to mobility or an increase in fatigue when being active. Rollators come in different styles with a variety of features including a 3 or 4 wheel option. When choosing a rollator to suit your needs, there are different factors you should take into account when making the decision. These can differ from why you need a rollator, to where you will be using it, or if you need a compact rollator that can be folded and stored easily. Other considerations can be safety features such as brakes or the type of grips, or if you need a folding seat on it. When choosing a rollator, the purpose of the rollator is a very important consideration. A four wheel rollator will offer more support over long distance walks or if you need to take breaks during your trip, as most have a seat. Larger wheels can handle tougher terrain so if you’re looking to use your rollator outside, a larger wheel may be more suitable. If your rollator is only going to be used in the home to move from one room to another, a small 3 wheel rollator could be the right choice. Three wheel rollators are generally smaller, can fold to a compact size and have a much tighter turning radius, which is ideal for indoors. 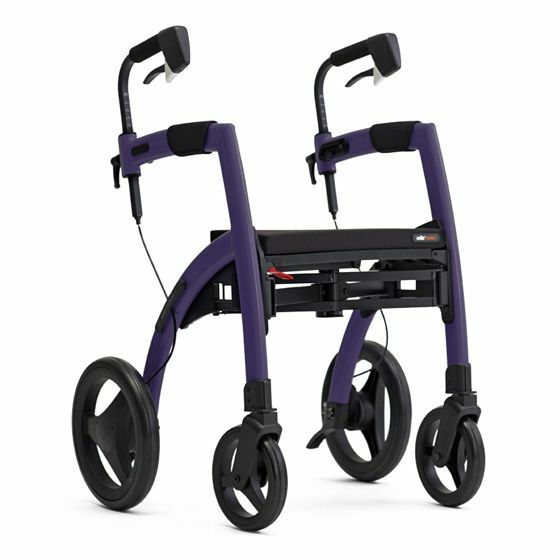 The size of the rollator will be one of the main factors when choosing one but the majority of them come with height adjustable legs so you need to find the right height for you. The height of your rollator should be the same height as the distance from the floor to your wrist while in a standing position. You should be able to hold the top of the rollator while your elbows are at a 15 degrees bend, this will be your position while holding the mobility device and walking. You are going to be gripping the rollator at the handlebar or handles. These can have different grips and you should choose the grip that you feel more comfortable with. A rubber grip may be suitable for someone who struggles to keep a grasp of things. If your hands get sweaty or you’re worried about moisture a plastic grip may be a better option. Foam grips are more comfortable to hold for longer but the foam can easily be stained and can also hold moisture. When you are deciding on what grip you want, you should make sure the grip is secure and isn’t sliding when you grasp it. If you are going to be transporting the rollator often, then choose a folding and portable rollator. Many folding rollators can be folded into a size small enough to fit in the boot of a car or to fit in storage areas on public transport which makes them suitable for people who plan on travelling with them. The foldable rollators are also easily stored in a closet at home. Rollators can come with different brake features like Ergonomic loop brakes with internally routed brake cables for added safety or arthritic-friendly brakes which means the brakes are extra sensitive and easy to use. Other features the rollators may have can be an added seat so the user can sit down if they need to take a break from their walk. This can be an excellent addition if the user suffers from fatigue when walking or if their legs get weak on long walks. A shopping basket is also an option to add to your rollator if you need to carry messages down the town or home without using your hands. Finding a rollator that fulfils your requirements can be tricky sometimes but hopefully, these tips can help you when making the right decision. If you would like help or more information when choosing a rollator, you can contact us on 1890 989 353 or email info@beechfieldhealthcare.ie and we would be happy to help you.